This cake was so much fun to make. It provided two challenges for me, the first being it had to be gluten free, and the second was it had to be cut into a specific shape. I enjoyed taking on both challenges! I found a fabulous recipe on allrecipes.com, and topped it with a yummy butter cream. We sampled a bit of the cake, and I don’t think anyone would ever know it was gluten-free. It was a delicious dense chocolate cake that you could serve to all your friends regardless of their level of gluten tolerance. This was my first time ever cutting a cake into a specific shape. I have made cakes with shape in the past, but I used an Elmo pan and a heart-shaped pan. 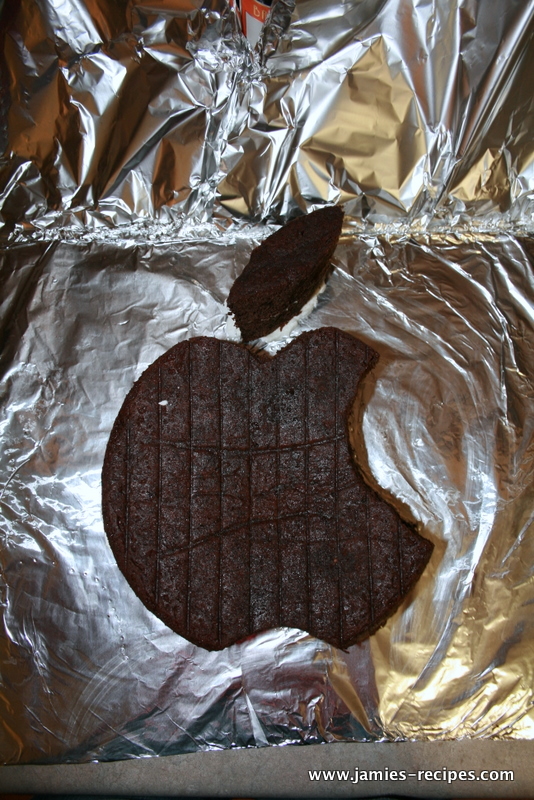 I shaped this cake into the Apple logo. I think I was successful in completing the challenges — unless John Henry got sick (I hope not!). John and Denise are both artists and Denise totally rocks at decorating cakes, so I was a little nervous shaping this cake. I am happy how it turned out and hope they really enjoyed it! Cut parchment paper to fit into two 9 inch round pans. Grease the pans and set aside. In a medium bowl, sift together the sorghum, tapioca, and rice flours with the cocoa powder, xanthan gum, baking powder, and baking soda. In your mixer bowl, cream the butter until light and fluffy. Slowly beat in the sugars; whip until fluffy. Beat in the eggs and egg yolks one at a time. Add the vanilla. On low speed, alternately combine the buttermilk with the flour mixture. Pour batter into prepared pans. Bake for 30 minutes or until cooked through. Cool in pan for 15 minutes. Turn out onto wire rack and cool completely. In your mixer whip together shortening and butter until light and fluffy. Slowly (1 cup at a time) add your powdered sugar. Once all the powdered sugar is added the mixture will look dry. Add milk 1 tablespoon at a time until butter cream looks soft, smooth and fluffy. Use right away or store covered in the refrigerator. Set out on counter to soften up a bit before using. Once the cakes are completely cooled place one cake on a cake board, spread about 3/4 cup frosting, top with other cake (placing top side on the frosting so the flat bottom is now the top). Cover your cake and place in the fridge for a couple hours or overnight -- it will be much easier to cut. 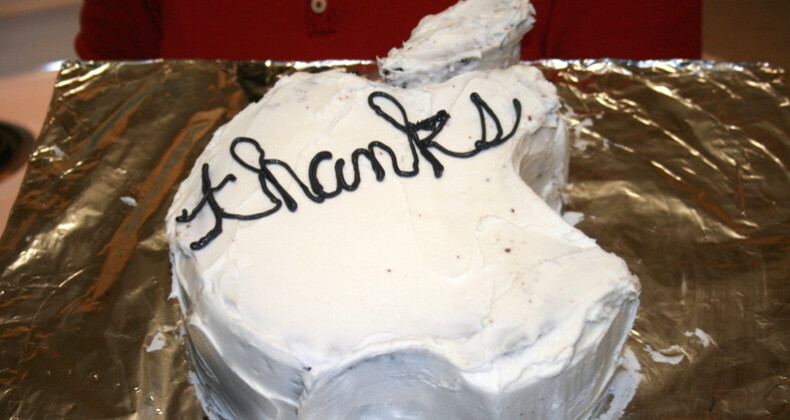 Cut your cake into desired shaped. In order to stabilize the apple leaf I inserted a wooden skewer from the bottom side. Dust off all crumbs with a pastry brush. Cover the cake with a thin layer of butter cream. (I thinned my butter cream with a splash of milk) This is called the crumb coating, which in theory will provide a foundation for your frosting, so you can finish it smoothly. Refrigerate your cake another 15-20 minutes so the crumb coating can set. Finally using an offset spatula, evenly spread your butter cream over the top and sides of your cake. ENJOY!! 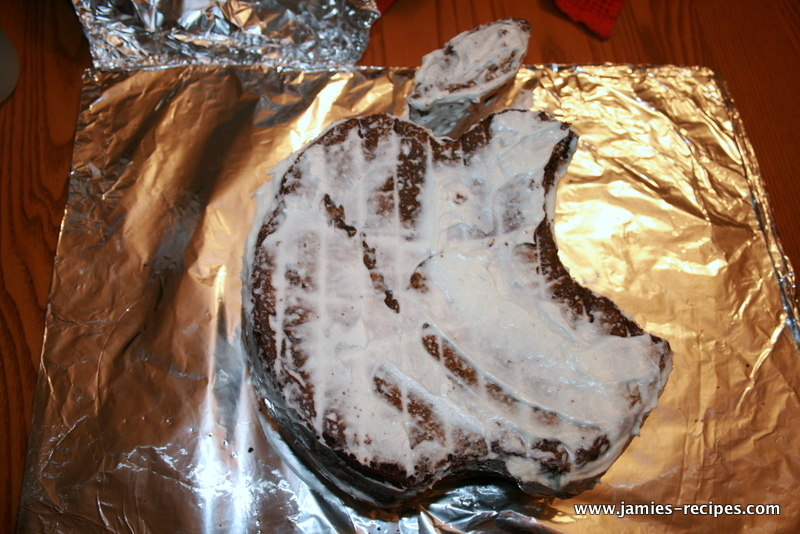 Jamie, This cake definitely looks and sounds delicious! I’m going to have to try this recipe. Thanks for sharing! I’m Jamie and I am the creator, recipe developer, and photographer behind The Kitchenarium. Slow Cooker Spinach Artichoke Dip is a HUGE time saver this busy time of year. Red, White, and Booze! Happy 4th of July weekend. A celebration with fireworks deserves a sangria equally as festive. This is a perfectly patriotic sangria. Brussels Sprouts Bacon Frittata is a combination of your favorite side dish and brunch. The tender roasted brussels sprouts and crispy salty bacon were obviously made for eggs! Taco Bread is the perfect way to use up leftover taco meat. It is ideal for lunch, dinner, or served as an appetizer. Puff Pastry Egg Souffle is the perfect breakfast to make it look like you tried harder than you actually did. 🙂 Served individually, these souffle look like something you would be charged $10+ for at a fancy brunch place. Raspberry Baked Donuts are the perfect red and white Valentine’s Day breakfast. These are easy to mix up even on a busy weekday morning. Easter Peanut Butter Blossoms using Reece’s peanut butter eggs is a fun spin on a classic cookie. Every bunny will love this cookie! The ricotta and lemon make for really fluffy and cheery pancakes. They taste like Spring. You may forego regular ole pancakes forever. Primavera means Spring and this pasta is filled up with some delicious Spring flavor. Asparagus, lemon zest, shrimp, and Parmesan cheese all play well with browned butter. Quick enough for a week night dinner and fancy enough for guests makes this a big winner in my book. A lightly seared Ahi Tuna steak and wasabi powder whisked into a vinaigrette all combined into a salad I will be eating on repeat this year. Uh oh. Something went wrong. Can you double check your email address and try again? Thank you so much! To confirm your subscription, please check your email and follow the link.